Select, copy, paste, and create. Whether for a historical project or a personal story, this is a common process we do almost instinctively. We select the information that can help us explain better what is in our minds. Then, we copy extracts from those texts and images and paste these patches of information into a canvas to make our story more compelling and enriching. Finally, we create a narrative by arranging and constructing the information according to our point of view. These are common steps we learned at school and that we can apply easily in our computers when browsing the web. These were also recurrent stages in the way individuals produced narratives in the past. People from the nineteenth and early-twentieth centuries might not owned computers to do it, but they had scrapbooks. Cover of a patented Mark Twain Scrapbook. Taken from “Mark Twain, Scrapbook Innovator,” by Brandi Oswald. West Virginia University Libraries, 2015. Scrapbooks are a method of preservation and display for different types of memorabilia used to recreate a history or personal experience. Along with items such as family pictures, drawings, letters, and notes, scrapbooks integrate ephemera selected by the makers due to a particular meaning. Commercial photographs, pamphlets, menus, stickers, newspapers clips, postcards, and maps are some of the mundane objects used for the creation of scrapbooks. Once the makers decide to integrate certain media in their scrapbooks, they are “writing” a narrative using material culture. This process changes the aesthetic and historical value of the artifacts. 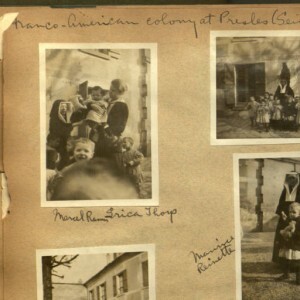 By transforming mass-produced objects to evidences of an individual rationale, the maker is “anchoring and performing personal memory and domesticating the iconic status of some images.” Hence, scrapbooks can be personal and particular, yet they also reflect a broader tradition in the U.S. history of collecting and displaying. From family stories, travels, and warfare, scrapbooks are a compelling resource that have helped to organize and display memories, a story that does not require writing with words. 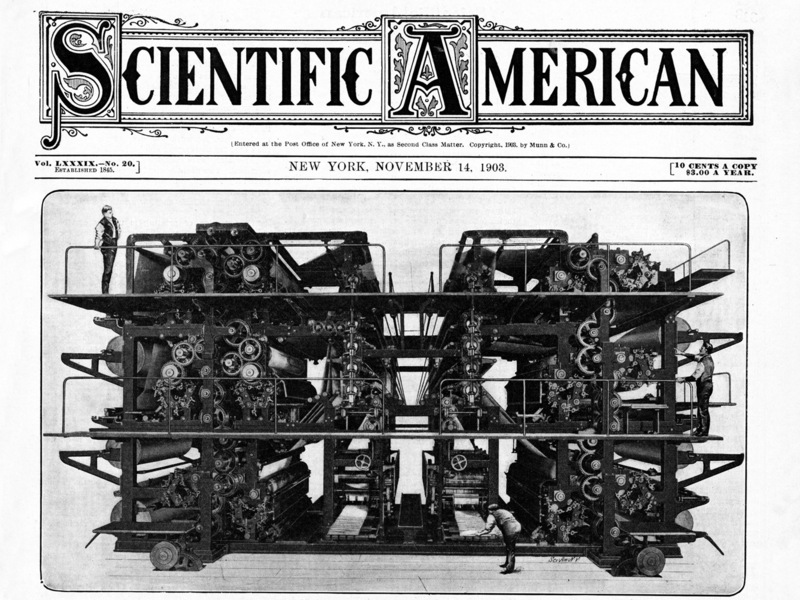 Cover of Scientific American, November 14, 1903, showing the Hoe Double Sextuple Press. Also in “News Paper Spires. From Park Row to Times Square.” The Skyscrapper Museum. The increased popularity of scrapbooking in the U.S. came hand-in-hand with the age of the industrial revolution and the printing technology by the turn of the nineteenth century. The use of the rotary steam presses, introduced by Friedrich Koening in 1810, replaced hand operated machines, speeding the time production of newspapers. The manufacture of chromolithographs and other color printings also became a fad among collectors and increased the variety of materials for the composition of scrapbooks. The development of printing technologies and paper manufacturing made the media cheaper and more accessible, expanding the speed and circulation of the information in the global context. It also increased the value of collecting printed jobs that, due to their textual or visual content, were too precious to discard. 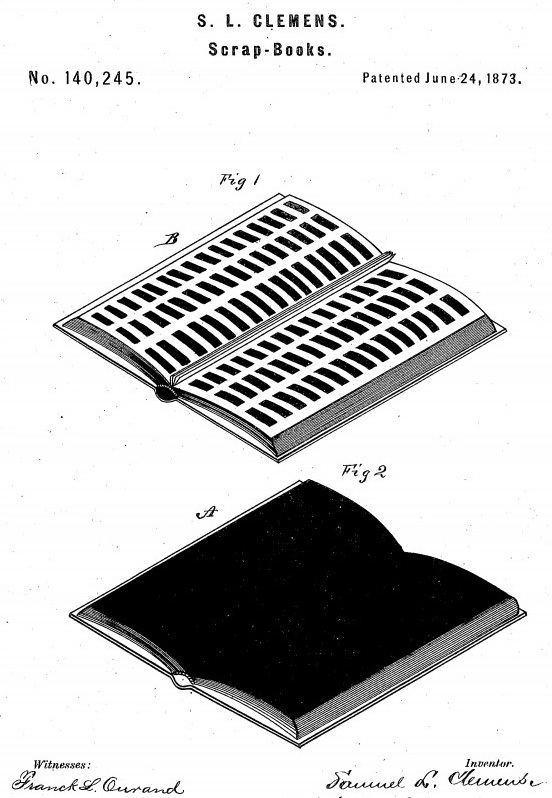 Patent #140245: Self-Pasting Book, by Samuel Langhorne Clemens, aka Mark Twain, 1873. Taken from “Mark Twain, Scrapbook Innovator,” by Brandi Oswald. West Virginia University Libraries, 2015. By the mid-nineteenth century, scrapbooking was a well-known activity that demanded the creation of particular technologies for its improvement. In 1873, Mark Twain attended these needs with the Patent #140245. Twain, an avid maker of scrapbooks, was tired of the inconveniences the glue produced and invented a self-pasting book especially designed to facilitate the creation of scrapbooks. The self-pasting pages prevented the troubles. This enhanced the methods in which common people engaged in the process of collecting and reusing the widespread information, using the Mark Twain Scrapbooks as their canvas. 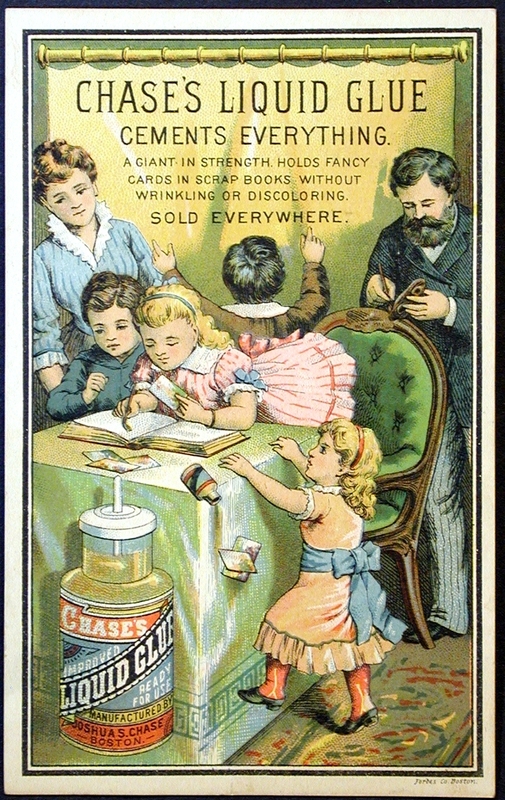 Advertisement for “Chase’s Liquid Glue” showing a family working on a Scrapbook. Color Lithograph by Forbes Co., Boston, circa 1880. Taken from Peter’s Paper Antiques. Scrapbooking is considered a household activity used to preserve family memories. Mothers, fathers, and children gathered in their books ephemera related to their own interests: housekeeping, recipes, poetry, news, etc. Due to its strong correlation with the household, it is a common belief that scrapbooking was solely a female activity, linked with traditional roles of the women as the pillar of the nuclear family. Nonetheless, several nineteenth and twentieth-century scrapbooks suggest the contrary. Mark Twain, for example, was an enduring producer and keeper of scrapbooks. Twain took his scrapbooks with him everywhere and filled them with souvenirs, pictures, and articles about his books and presentations. 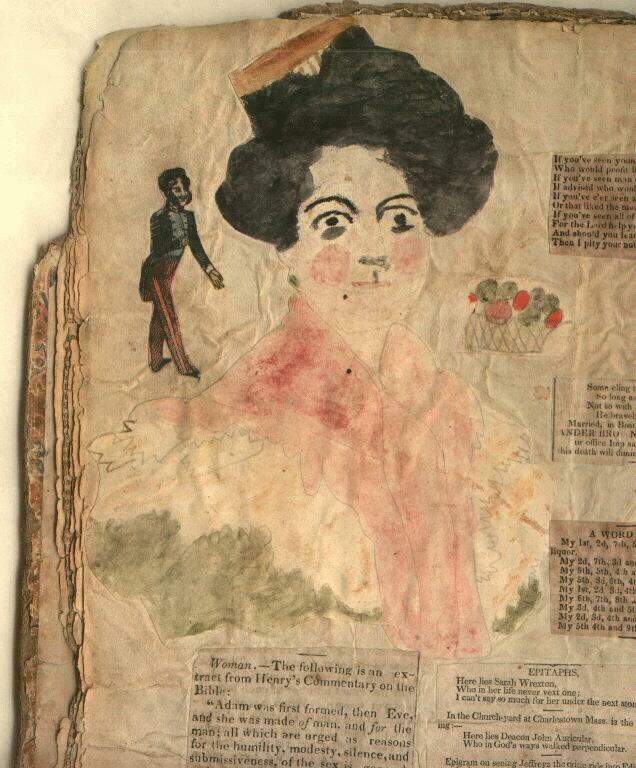 Page Extract from Sarah Tuttle’s Scrapbook (1834-1860s), and American women who began her scrapbook at a young age. From the Collection “Nineteenth-Century American Children & What they Read.” Merry Coz. environment. Scrapbooking became a popular activity in the public education movement. Master educators encouraged teachers to keep anthologies of clippings and artworks to use in the instruction of the students. From 1860 to 1930, “the training of kindergarten teachers included making albums with geometric designs.” Educators also promoted the teaching of scrapbooking among their students as a strategy to learn art skills, to sort and categorize. 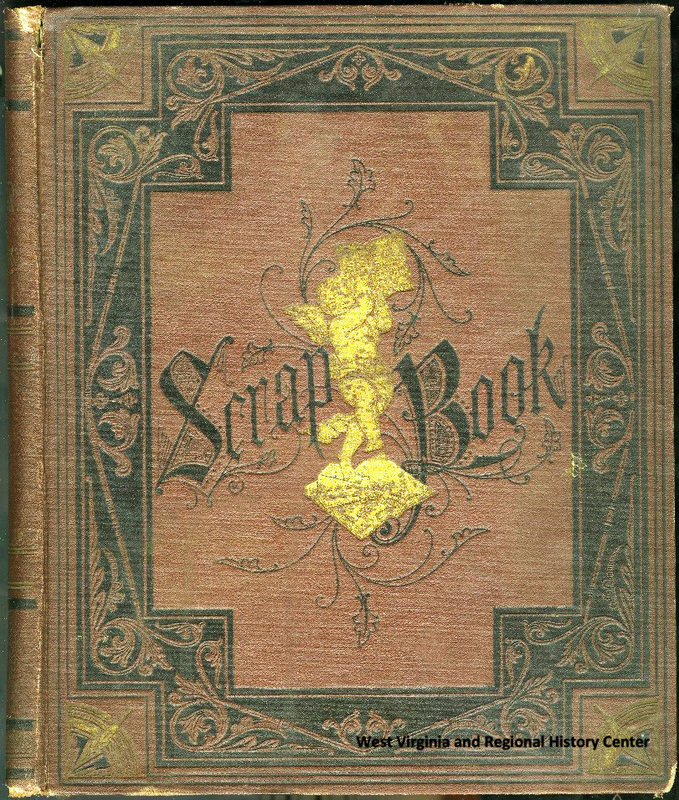 The making of scrapbooks became so widespread by the mid-nineteenth century that several authors also published periodicals to describe their purpose and methods. Hartford Connecticut, for example, circulated The Scrapbook, a publication that contained detailed information about the formats for displaying newspapers clips and pictures in scrapbooks. “Statue of Ramses II,” page from the Album On the Nile. Cairo to Luxor, created by William Vaughn Tupper. From the William Vaughn Tupper Scrapbook Collection. Boston Public Library. By the turn of the twentieth century, thousands of Americans explored the world for business and pleasure and returned home with memorabilia used for making scrapbooks.The Brooklyn financer, William Vaughn Tupper, created a set of forty six handmade scrapbooks to record his travels to Europe and North Africa between 1891 and 1895. Tupper used mass-produced printing media to describe and delineate his journeys, which embellished with detailed annotations and drawings. In a similar way, scrapbooking also took a significant place in the way Americans rememorized the battle fields. Since the U.S. Civil War (1861-1865), families devoted to collect, cut, and paste printed to leave traces of the battle. They also did it to create connections with their love ones fighting the in the frontline. This tradition also remained in the way we remembered the participation of the country in the WWI. 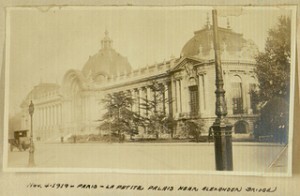 After the war ended, Alma Clarke and Frank Steed returned home carrying with them a wide scope of material culture about their experience in Europe. Through photographs and documents, Alma Clarke “wrote” her time in France as a volunteer helping French orphans and as a nurse for the American Red Cross. Her collection of patriotic material also documents U.S. and France position about the war. 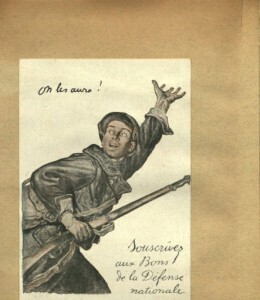 The three images belong to the “French WWI Scrapbook,” by Alma Clarke, circa 1927. From the Alma Clarke Papers Collection. Bryn Mawr College Special Collections. 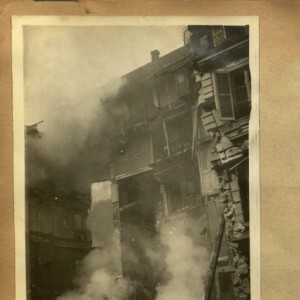 Meanwhile, in the aftermath of the conflict, Frank Steed, an Army field clerk in the Casualty Division of the American Expeditionary Forces in France, created scrapbooks using material culture from his travels to different European cities. Steed integrated personal documents and pictures with ephemera that reflect leisure and quotidian activities in the midst of the war, such as photographs, menus, brochures, transportation tickets, and touristic pamphlet. “Paris. Bookstalls along the Seine. Vicinity of the Latin Quarter,” by Frank Steed. Extracted from the “Manuscript Journals of Frank R. Steed US soldier in WWI France, 1918-1919.” Digital Library, Villanova University. 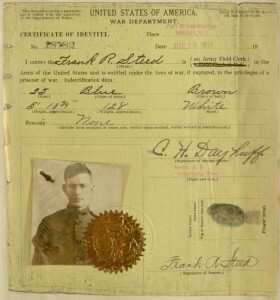 Certificate of Identity of Frank Steed. Extracted from the “Manuscript Journals of Frank R. Steed US soldier in WWI France, 1918-1919.” Digital Library, Villanova University. Similarly to Tupper, Steed and Clarke narrate their experiences as participants and observers of a foreign land. With the war, the experience of collecting and preserving crossed the barriers of the household and the quotidian space, displaying elements that documented those moments and ideas that reshaped the country itself. These scrapbooks document a particular vision of the global history and reflect the ever-changing meaning of the material culture through a method that trespassed the barriers of the industrial revolution. Garvey, Ellen Gruber. Writing with Scissors. New York: Oxford University Press, 2012. Nordström, Alison. “Making a Journey: The Tupper Scrapbooks and the Travel they Describe.” In Photographs Objects Histories. Edited by Elizabeth Edwards and Janice Hart, 81-85. New York: Routledge, 2004. Ott, Katherine et al. “An Introduction to the History of Scrapbooks.” In The Scrapbook in American Life. Edited by Susan Tucker, Katherine Ott, and Patricia Buckler, 1-21. Philadelphia: Temple University, 2006. Alison Nordström, “Making a Journey: The Tupper Scrapbooks and the Travel they Describe,” in Photographs Objects Histories, Elizabeth Edwards and Janice Hart ed. 81-95 (New York, Routledge, 2004), p.81. Nordström, “Making a Journey,” 91. Garvey, Writing with Scissors, Chapter 3; Katherine Ott et al, “An Introduction to the History of Scrapbooks,” in The Scrapbook in American Life, Susan Tucker, Katherine Ott and Patricia Buckler ed., 1-21 (Philadelphia: Temple University, 2006), pp. 7-9. Garvey, Writing with Scissors, p. 61. Nordström, “Making a Journey,” 81-82. Ellen Gruber Garvey’s book, Writing with Scissors, offers a rich analysis about the use of scrapbook during this period.